THE FIGHTER: Zamperini (O'Connell) spent two years in a Japanese POW camp; director Jolie and the real-life hero, who passed away last July at age 97. At the height of the Second World War, Louis Zamperini and two other American army colleagues were lost at sea, 47 days on a raft adrift in the Pacific Ocean, feeding on raw fish, fending off shark attacks and enduring vicious sunburns. Rescued by the Japanese, he spent two years in a prisoner-of-war camp in that Asian Country, where was subjected to all sorts of abuse at the hands of hostile soldiers intent on eliminating "the enemy" of their country and their cause. Miraculously, after overcoming such horrific experiences, Zamperini emerged whole, bruised but not broken, and ready to dive back into the stream of life. If all this says anything to take to heart, it's that the human spirit is endlessly elastic and capable of surprising in ways you never imagined. 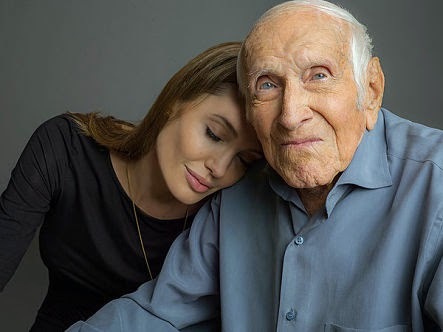 That's the feeling one comes away with after watching Unbroken, Angelina Jolie's captivating though ultimately uneven account of Zamperini's story. The film doesn't always strike the most emotionally authentic notes, but as with any film that deals with tragic loss, there are scenes so wrenching you can't look away and, at the same time, it chronicles an important and incredible true story centred on a man who, for many, epitomizes the very definition of survivor. But there's more. What makes Zamperini's story all the more intriguing is his trajectory as an Olympic long-distance champion-turned-soldier, hailing from a family of Italian immigrants who fought tooth-and-nail to make their way in a foreign land, determined to achieve their vision of the American Dream. As convincingly portrayed by British sensation Jack O'Connell, Zamperini comes across as a ne'er-do-well who, spurred on by the motivations of an older brother, found purpose only to have it subsumed when, in service of his country and fellowmen, an aerial rescue mission goes horribly wrong.